Sugra Infra Care was established in the year 2010. We are leadingService Provider of Building Structural Repairs Service, Civil Repair Work, Painting & Waterproofing Services etc. 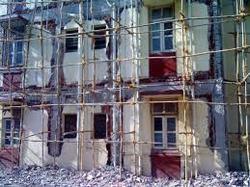 We have an exclusive range of Structural Repairing Service providing to our clients. Our personnel make use of quality replacement components and other materials whilst executing. We have engineers who with the help of our skilled personnel render these services using modern technology in adherence with the international quality standards. Our professionals interact with clients and as per their requirements, offer these services.